Seven persons A, B, C, D, E, F and G are born in seven different days of the same week starts from Monday to Sunday. They all like different chocolates viz., Milky Bar, BarOne, Kit-Kat, Snickers, Munch, Galaxy and 5 Star but not necessary in the same order. 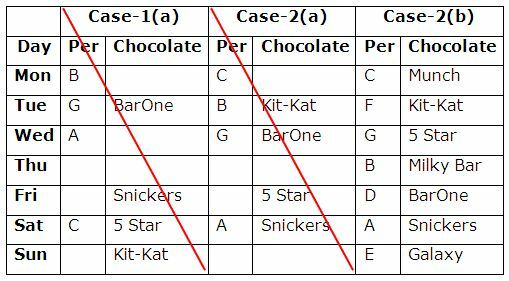 Only two persons are born between the one who likes Snickers and G, who does not born after Wednesday. The one who likes Snickers does not born in Thursday. The one who likes BarOne was born immediately after B. As many persons born after the one who likes BarOne is same as born before the one who likes 5 Star. B does not like Snickers. Only three persons are born between A and the one who likes Kit-Kat. C was born immediately before the one who likes Kit-Kat. The one who likes Munch was born immediately before F. More than three persons are born between F and the one who likes Galaxy. As many persons born between C and the one who likes 5 Star is same as born between D and the one who likes Galaxy. 1. B likes which of the following chocolate? 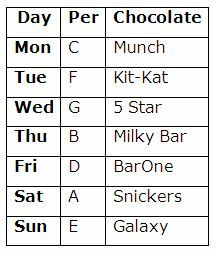 Only two persons are born between the one who likes Snickers and G, who does not born after Wednesday. The one who likes Snickers does not born in Thursday. The one who likes BarOne was born immediately after B. As many persons born after the one who likes BarOne is same as born before the one who likes 5 Star. B does not like Snickers. Only three persons are born between A and the one who likes Kit-Kat. C was born immediately before the one who likes Kit-Kat. The one who likes Munch was born immediately before F. More than three persons are born between F and the one who likes Galaxy. As many persons born between C and the one who likes 5 Star is same as born between D and the one who likes Galaxy. 2. How many persons are born between D and the one who likes Munch? 3. D was born in which of the following days? 4. If G is related to BarOne and E is related to Munch in a certain way. Then F is related which of the following? If ‘R&S’ means ‘R is the spouse of S’. 6. In the expression ‘A % B $ C & D % E # F’, how is A related to F? 7. In the expression ‘J @ K & L # M % N & P’, if M is the only son of K then how is P related to L? 8. In the expression ‘P $ Q & R @ S % T @ U’, how is P related to U? Point S is 6m to the east of point P. Point J is 4m to the north of point S and 8m to the east of point N. Point V is 9m to the south of point N. Point Q is 3m to the west of point V. Point D is 5m to the north of point Q. Point B is 4m to the west of point D.
9. What is the distance and direction of point D with respect to point S? 10. Four of the following five are alike in a certain way and hence form a group. Which one of the following that does not belong to the group? 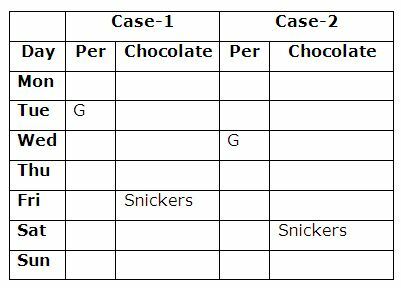 1) B likes which of the following chocolate? 2) How many persons are born between D and the one who likes Munch? 3) D was born in which of the following days? 4) If G is related to BarOne and E is related to Munch in a certain way. Then F is related which of the following? 6) In the expression ‘A % B $ C & D % E # F’, how is A related to F? 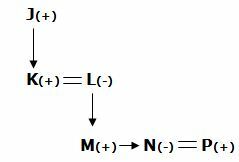 7) In the expression ‘J @ K & L # M % N & P’, if M is the only son of K then how is P related to L? 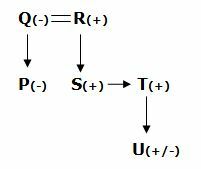 8) In the expression ‘P $ Q & R @ S % T @ U’, how is P related to U? 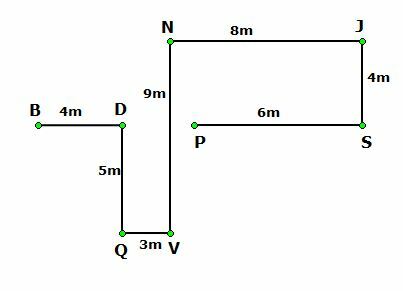 9) What is the distance and direction of point D with respect to point S? 10) Four of the following five are alike in a certain way and hence form a group. Which one of the following that does not belong to the group?